As Luke’s story has progressed the good news has slowly been revealed: to a minor Temple priest, to a childless woman, to a peasant girl, even to scruffy shepherds out in the muddy fields. Now the good news comes to a very old man. The Hebrew word anawim means “those who are bowed down”. The anawim were the poor of every sort: the vulnerable, the marginalized, those without any control over their own lives. But over the centuries the word anawim also came to characterize those who knew how to depend on God, who waited for God to fill their emptiness. Mary’s Song pointed to them: “the humble have been lifted high, the hungry have been satisfied with good things” (Luke 1:52), and Jesus’ first Beatitude would also lift them up: “Blessed are the poor” (Luke 6:20). So while Simeon is so old he seems to be waiting only for death, he has actually been patiently waiting for his own good news. Now, as he holds this baby and his old arms feel his warmth, his old eyes see the arrival of good news. For centuries, Christians have been taught that the Holy Spirit first arrived in tongues of fire on Pentecost, forgetting that the first verse of the first chapter of the first book of the Hebrew Bible (Genesis 1:1-2) says that “the spirit of God hovered over the waters”. In fact, Luke’s Gospel begins with the Spirit already at work: Zechariah, Mary, Elizabeth have all felt the Spirit’s power. 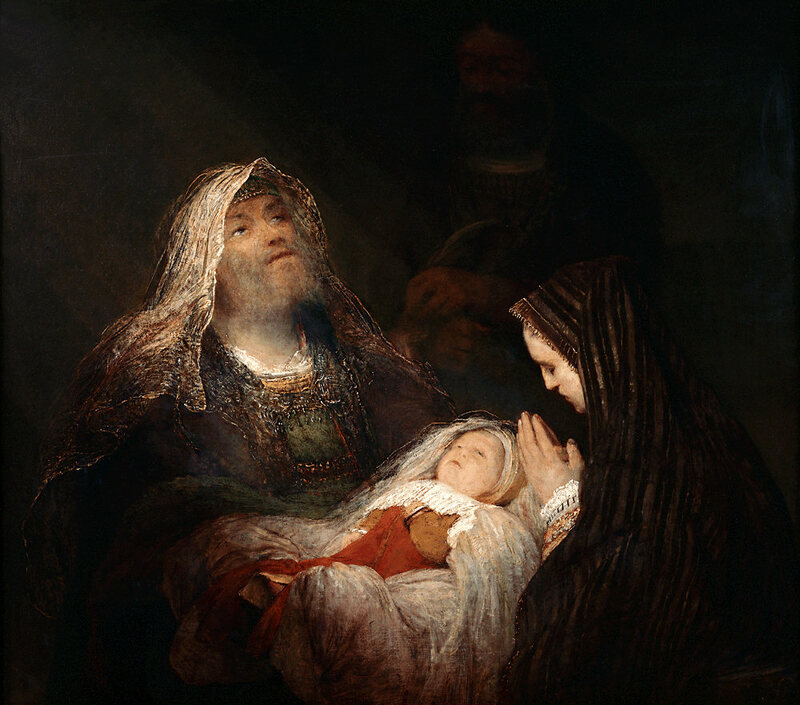 Now the Spirit guides Simeon into the Temple, and him who this baby will become.